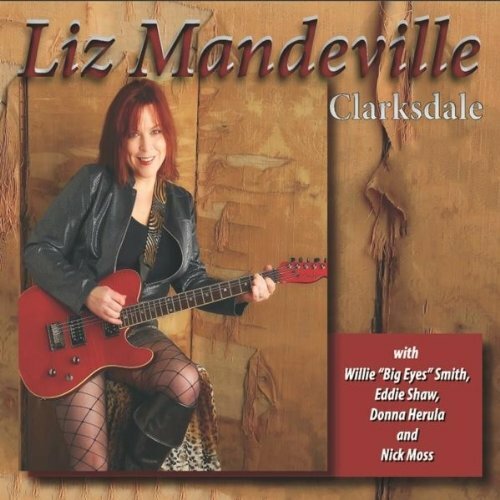 If there were ever any questions about Liz Mandeville’s blues credentials (and there shouldn’t be), consider this – Clarksdale, her debut on her own Blue Kitty label, features the very last recordings of the legendary Willie ‘Big Eyes’ Smith on both harp and drums. Indeed, it was Smith, a close friend, who encouraged Mandeville to launch her label, and plans for a follow up were in the works at the time of Smith’s passing. Also on hand to help out on a track each are the equally legendary Eddie Shaw on sax and guitarist Nick Moss, a modern-day blues powerhouse in his own right. Elsewhere there’s bass, piano, and slide guitar here and there, but in truth Mandeville’s just fine on her own, her intricate guitar and powerful, growly vocals more than enough on a couple of solo tracks, while elsewhere accompaniment is spare and supportive. Mandeville wrote al the material, ranging from the exuberantly naughty “Roadside Produce Stand” (it ain’t her fault!) to the gritty, kitchen-sink reality of “A Soldier’s Wife.” She reflects on relationships with “Mama And Daddy Blues,” exposes the absurdity of the ‘war on drugs’ with “4:20 Blues,” and is proudly patriotic on “My Mama Wears Combat Boots,” a song that could well be an unofficial anthem for women in uniform. Her delivery on the acapella “No Fear / Everything” is spine-tingling in its gospel fervor, while “Sand Baggin’” again highlights her coy and playful side. The range is impressive, but through it all it’s Mandeville’s personality that shines through magnificently. Production is top-notch, but rather than studio sheen and pop perfection, every song sounds personal – there’s no question that they’re Mandeville’s babies, her pride and pleasure, and she throws herself into every tune with infectious enthusiasm and joyous abandon tempered with years of hard-won experience (Mandeville has released four previous discs on the venerable Earwig label and has led her own band in Chicago for years). The best blues manages to be both personal and universal, an emotional expression that connects on a visceral level. To truly work, the blues requires both strong songwriting (if it’s too personal, too topical, it simply won’t resonate) and passionate performances that sound as though they’re as necessary as breath itself. Mandeville has pulled it off admirably, with a disc that, even in its more somber moments, is pure pleasure through and through.